Nicole received her PhD in Marketing and International Business from the University of Auckland. She also holds an MSc (Technology Management) and BComm Hons (Marketing) from the University of Saskatchewan. In 2010, she received an honorary doctorate from the Turku School of Economics (Finland). Through her career, Nicole has held academic appointments in New Zealand, Canada and Finland. Now, she is the inaugural Lazaridis Research Professor at Wilfrid Laurier University in Waterloo, Canada. Nicole is also the Research Director of the Lazaridis Institute for the Management of Technology Enterprises. She studies high-growth technology firms, focusing on a variety of topics at the intersection of marketing strategy, international business and entrepreneurship. 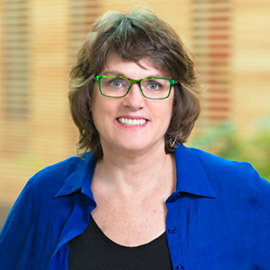 Her work is published in the top journals across all three of her disciplinary areas, including Journal of Marketing, Journal of the Academy of Marketing Science, Journal of International Business Studies, Journal of World Business, Journal of Business Venturing, Entrepreneurship Theory and Practice, and Academy of Management Review. Nicole’s current research programme involves projects in Canada, Spain, Finland and Germany. She is also working with colleagues from the Lazaridis School and UC Berkeley’s Sutardja Center for Entrepreneurship and Technology on a major entrepreneurship study through the European Innovation Academy in Portugal. More locally, Nicole leads a SSHRC-funded team in the study of marketing-related innovation capabilities for high growth technology firms. In 2016, Nicole was recognized as Laurier’s ‘University Research Professor.’ In 2018, an international study showed her to have four of the most influential publications in International Marketing- more than any other scholar in the world. In 2014, she was ranked as the number two scholar worldwide for International Marketing. Nicole was also ranked eighteenth in the world for International Business, the only female in the ‘top 20’ list for that discipline. Nicole is Associate Editor at the Journal of Business Venturing - the premier journal for entrepreneurship research. She is also Consulting Editor at the Journal of International Business Studies and sits on numerous other editorial boards. She teaches in the Lazaridis School’s International Business Concentration (undergraduate) and a PhD seminar course in Marketing Strategy. Nicole’s research intersects marketing strategy, international business and entrepreneurship, typically in the context of technology firms. She works with colleagues worldwide. Adaptation in a Digitized Environment: Insights from New International Ventures (with Anne Domurath, Lazaridis School; Holger Patzelt, Technical University of Munich). A Kaleidoscope View of How Entrepreneurial Networks Develop (with Valtteri Kaartemo and Niina Nummela, University of Turku, Finland). How Marketing Capabilities and their Micro-Foundations Influence Innovation Success (with Anne Domurath and Sarah Wilner, Lazaridis School). Post-Entry Trajectories of International New Ventures (with Francisco Acedo, University of Seville, Spain). Pre-Foundation Innovation Collaboration Influences on Early Internationalization (with Achim Walter, Christian Albrechts University of Kiel, Germany; Thomas Ritter, Copenhagen Business School, Denmark; and Nora Otte, BDO, Germany). 2017-2021: Social Sciences and Humanities Research Council Insight Grant, $135,205 (principal investigator). 2018: Reported as one of the most influential International Marketing scholars in the world with four articles in the ‘Top 25’ list of publications for 1995-2015 (Leonidou, Katsikeas, Samiee & Aykol, 2018). 2018: Spanish Ministry of Economics and Competition Grant; Co-Investigator (48,000 Euro). 2016: University Research Professor, Wilfrid Laurier University, Canada. 2008-2016: Social Sciences and Humanities Research Council Strategic Knowledge Cluster Grant, $1.95 million (co-investigator). 2015: Senior Research Excellence Awards, Lazaridis School of Business and Economics, Wilfrid Laurier University, Canada. 2013: Gerald E. Hills Award for Outstanding Contribution to Entrepreneurial Marketing, American Marketing Association and the AMA Entrepreneurial Marketing Special Interest Group. 2010: Honorary Doctorate (DSc econ h.c.), Turku School of Economics, University of Turku, Finland. 2008: Best Reviewer Award, Journal of International Business Studies. 2006: Sustained Research Excellence Award, Auckland Business School, University of Auckland, NZ. 2006: Distinguished Research and Leadership Award, UIC/AMA Research Symposium on Marketing and Entrepreneurship. Nicole is currently supervising a number of doctoral students in the areas of marketing, entrepreneurship and international entrepreneurship. At this time, she is unable to accept new students. N Coviello and H Yli-Renko, eds, 2016. Handbook of Measures for International Entrepreneurship Research: Multi-item Scales Crossing Disciplines and Contexts, Cheltenham, UK: Edward Elgar Ltd.
N Coviello, MV Jones, PP McDougall-Covin. 2016. “Is International Entrepreneurship Research a Viable Spin-off from its Parent Disciplines?” in Institutionalization of Entrepreneurship: Hopes and Pitfalls for Entrepreneurship Research, A Fayolle and P Riot (eds. ), London: Routledge (78-99). N Coviello. 2014. “How to Publish Qualitative Entrepreneurship Research in Top Journals,” in How to get Published in the Best Entrepreneurship Journals: A Guide to Steer Your Academic Career, A Fayolle and M Wright (eds. ), Cheltenham, UK: Edward Elgar, 167-182. Kerr, Jon and Nicole Coviello. The Formation and Constitution of Effectual Networks: A Systematic Review and Synthesis, International Journal of Management Reviews (forthcoming). Mehrabi, Hamed, Nicole Coviello and Chatura Ranaweera. Ambidextrous Marketing Capabilities and Performance: How and When Entrepreneurial Orientation Makes a Difference, Industrial Marketing Management (forthcoming). Kaartemo, Valtteri, Nicole Coviello and Peter Zettinig (2018). International Entrepreneurship as an Admittance-Seeking Educational Field, Journal of Teaching in International Business, 29 (3), 185-212. Coviello, N, L Kano and P Liesch, 2017. Adapting the Uppsala Model to a Modern World: Macro-Context and Microfoundations, Journal of International Business Studies, 48(9), 1151-1164. Reuber, A Rebecca, Eileen Fischer and Nicole E Coviello (2016), “Deepening the Dialogue: New Directions for the Evolution of Effectuation Theory,” Academy of Management Review, 41 (3), 536-540. Coviello, Nicole E. (2015), “Re-Thinking Research on Born Globals,” Journal of International Business Studies, 46, 17-26. Coviello, Nicole E. and Richard M. Joseph (2012), "Creating Major Innovations with Customers: Insights from Small and Young Firms," Journal of Marketing, 76 (6), 87-104. Coviello, Nicole E., McDougall-Covin, Patricia P. and Benjamin M. Oviatt (2011), "The Emergence, Advance and Future of International Entrepreneurship Research," Journal of Business Venturing, 26, (6), 625-631. Jones, Marian V., Coviello, Nicole and Yee-Kwan Tang (2011), "International Entrepreneurship Research (1989-2009): A Domain Ontology and Thematic Analysis," Journal of Business Venturing, 26 (6), 632-659. Chandra, Yanto and Nicole Coviello (2010), "Broadening the Concept of International Entrepreneurship: Consumers as International Entrepreneurs," Journal of World Business, 45 (3), 228-236. Slotte-Kock, Susanna and Nicole Coviello (2010). "Entrepreneurship Research on Network Processes: A Review and Ways Forward," Entrepreneurship Theory and Practice, 24 (1), 31-57. Brodie, Roderick J, Winklhofer, Heidi, Coviello, Nicole and Wesley Johnston (2007). "Is e-Marketing Coming of Age? An Examination of the Penetration of e-Marketing and Firm Performance,” Journal of Interactive Marketing, 21(1), 2-21. Coviello, Nicole E. (2006). "Network Dynamics in the International New Venture" Journal of International Business Studies, 37(5), 713-731. Coviello, Nicole, Winklhofer, Heidi and Karla Hamilton (2006). "Marketing Practices and Performance of Small Service Firms: An Examination in the Tourism Accommodation Sector," Journal of Service Research, 9(1), 38-58. Jones, Marian V. and Nicole E. Coviello (2005). "Internationalization: Conceptualizing an Entrepreneurial Process of Behaviour in Time," Journal of International Business Studies, 36(3), 284-303. Coviello, Nicole E. and Marian V. Jones (2004). “Methodological Issues in International Entrepreneurship,” Journal of Business Venturing, 19 (4), 485-508. Coviello, Nicole, Brodie, Roderick, Danaher, Peter and Wesley Johnston (2002). “How Firms Relate to their Markets: An Empirical Examination of Contemporary Marketing Practices,” Journal of Marketing, 66 (3), 33-46.